1. Pre heat the oven to 150°c/300°F/Gas mark 2. Draw a 25cm circle on a piece of baking parchment & place it on a baking sheet. 2. Put the egg whites in a large clean bowl with salt and 125g of the sugar and whisk until doubled in size. Now, gradually add the remaining sugar, whisking until the mixture is stiff and glossy. Fold in the corn flour, white wine vinegar and cream of tartar. 3. Spoon the mixture evenly into the circle of baking parchment. 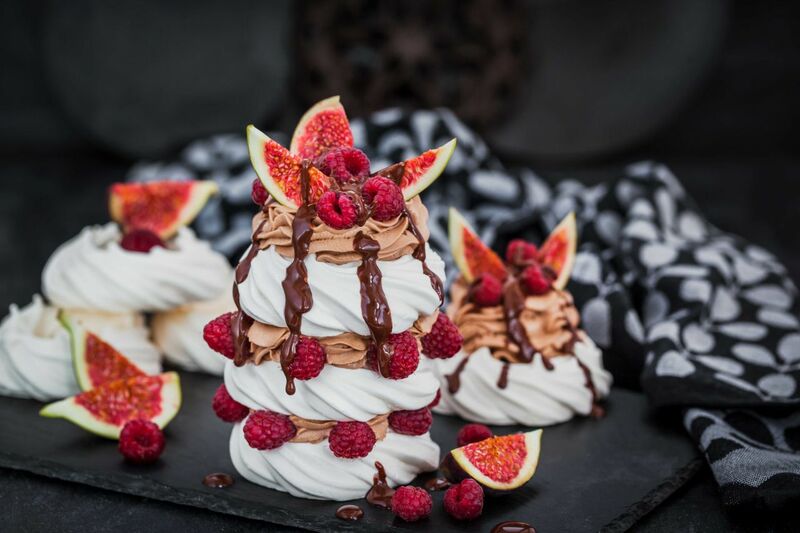 Bake the pavlova for 1 hour and 15 minutes, or until it has a crisp coating and comes away from the baking parchment without sticking. Peel the baking parchment off and place the pavlova on a baking sheet on a wire rack and set aside to cool. 4. Trim the figs stalks and cut a cross in the top of each fig. Gently squeeze open each fig and place in a bowl. Split the vanilla pod, scrape out the seeds and set aside. 5. Heat the sherry, honey & scraped-out vanilla pod in a saucepan. Bring to boiling point and pop over the figs. Cover the bowl with clingfilm and set aside for the figs to steam and soak up the liquid. 6. Put 70ml of the cream in a small non-stick saucepan over a medium heat. Add the dark chocolate, stir until fully melted but do not let it boil. 7. Whisk the remaining cream with 1 tsp of caster sugar and the vanilla seeds until stiff peaks form. 8. To serve, spread the vanilla cream over the pavlova. Drain the figs and arrange on top of the cream. Finish with a drizzle of the chocolate sauce or serve separately.